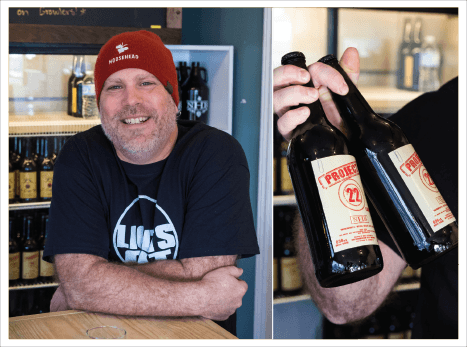 Rick Bailey, owner and founder of Northumberland Hills Brewery (NHB) is not your typical beer master. Growing up Rick wanted to be a rock star. He spent 15 years on and off touring the country with his Christian rock band. In Rick’s former life he was a contractor — more specifically a home builder. After being in the building industry since leaving postsecondary school he felt the gentle tug of the country pulling at him. He had been experimenting with home brewing for some time and thought perhaps that might be the next opportunity. He’d always been intrigued by beer and how it was made. At the time it was difficult to brew at home and to get the ingredients. Brewing wasn’t as popular then and grains were hard to get. Rick brewed vat after vat in his kitchen and used his friends as guinea pigs until he perfected brews that he could be proud of. In 2012 he and his wife picked up and moved from Oshawa to Cold Springs and would later relocate to Cobourg to open NHB. It wasn’t until visiting a popular Whitby, ON brewery that he realized his dream of one day moving his new passion from the kitchen to a brew house could actually be achieved. NHB classifies as a nano brewery but don’t let their size fool you — these ales are full bodied and ready to be consumed. The collection of craft beers has all been carefully brewed by Rick himself. He let us know that all the beers are reflective of his taste so if we have the same taste, you are going to love my beers!